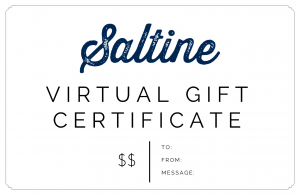 Saltine gift cards are available in multiple denominations in both traditional and printable formats. Virtual e-cards are delivered instantly via email with free delivery; plastic gift cards are shipped via USPS for $1.99 within one business day of order. Gift cards can be redeemed at any 4TopHospitality location. Virtual e-cards will be delivered instantly via email and can be redeemed by printing or displaying on a smartphone. Delivery is free for virtual e-cards. Select your desired amount to complete your purchase. Gift cards will be mailed via USPS within one business day of order for a standard $1.99 shipping charge. 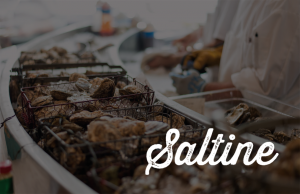 For questions or assistance, email help@4tophospitality.com.